The Old Makkah-Jeddah Highway ... being expanded. Saudi Arabia is expanding four highways linking Makkah and Jeddah, which will benefit 35 million people, a report said. The projects include the Makkah-Jeddah Highway, the Old Makkah-Jeddah Road, the Breman-Hada Al-Sham-Makkah Road, and a road for cargo and freight trucks that links the Second Ring Road in Jeddah and Hada-Al-Jamoum Roadway, according to Mohammed Madani, an official of Makkah Governorate. The new, wider roads will feature traffic signs to help reduce accidents along the way, reported Arab News. The 72-km Makkah-Jeddah Highway extends from Al Khair Bridge in Jeddah to the traffic light at Al-Dawariq Roundabout in Makkah. The highway includes four lanes in both directions, with a median extending the whole way, while work is under way for a fifth lane. The Ministry of Transport has recently also adopted expansion and improvement plans at a cost of some SR90 million ($24 million) to enhance safety along the road. According to Al Madani, traffic density is high along the highway, with the situation getting worse year by year, necessitating urgent expansion of these roads to serve the high number of travellers during peak seasons. He said most of the ongoing work would be completed before the coming Haj. As for the Old Makkah-Jeddah Highway, which is about 53 km long and is under the authorities of the Ministry of Transport, the Municipality of Jeddah, and the Municipality of Makkah, he said work was in progress to develop and improve the part of the roadway that is under the Ministry of Transport. The section of the road overseen by Makkah Municipality (122.15 km) has been completed, with work including lighting and construction of a shoulder in each direction being in progress to improve the roadway. 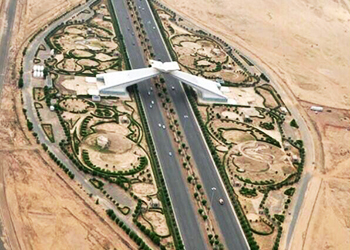 Work is also under way on the Hada-Al-Jamoum-Southern Jeddah intersection, the report said. The Hada Al-Sham-Makkah Roadway plays a major role in facilitating travel to King Abdul Aziz International Airport in Jeddah for passengers coming from Makkah and Taif. It also reduces the volume of large truck traffic on the Al Haramain Road between Taif, Riyadh, the Eastern Province and Jeddah. Meanwhile, work is under way on the truck and cargo roadway linking the Second Ring Road in Jeddah with Hada and Al Jomoum. Two sections are currently under implementation, with the remaining 17 km distance to be carried out later. The road will facilitate the transfer of cargo trucks from Al Mina and Southern Jeddah in the direction of Hada-Al-Jomoum, and will reduce the movement of trucks on the Al Khair Bridge (Mina) and the Makkah-Jeddah Highway. Al Madani said studies to implement the Middle Ring Road are in progress. The proposed Middle Ring Road will extend along King Saud Road in the north of Jeddah through Al-Zomorod 1 and 2 districts and Al-Sawarit 1, 2, and 3 districts, and intersects with Madinah Road through to east Jeddah. Meanwhile, key projects to improve the safety and quality of highway and bridge construction work in Saudi Arabia, are in the advanced stage of development and on track for completion in 2017, according to a report. The projects are being implemented through co-operation with The International Cooperation and Development Fund (TaiwanICDF).